These FOAF Sites are open social networking sites which host a large amount of 'Friend of a Friend' FOAF data. Typically, they generate it automatically for all users. If you know of sites not on the list, please add them. Site Example People links out? Elgg and other sites http://community.elgg.org/profile/hallak HTML Link to http://community.elgg.org/profile/hallak?view=foaf ? ? hi5 http://api.hi5.com/rest/profile/foaf/39290024 * ? ? LiveJournal http://danbri.livejournal.com/data/foaf * > 15M ? An actual URI of a person. * An asterisk means there is no URI for the person themselves, only for their FOAF file. Approximate number of people (and therefore of FOAF files) if known. Yes/No. In your profile, you can enter the URI of a FOAF identity you have on 'another' site. Is there a foaf:openid value that gives the URI of the (X)HTML page used for OpenID authentication? 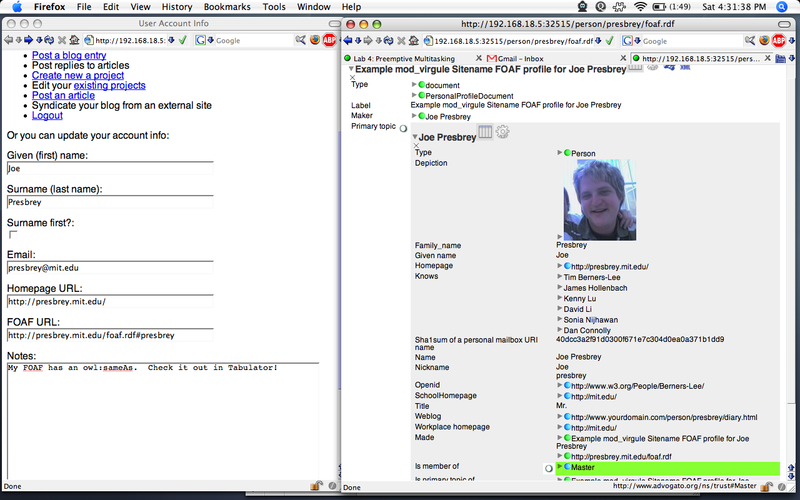 The Inverse Functional nature of the foaf:openid property enables use of my OpenID on par with my Personal URI via an inference-capable RDF User Agent (e.g., a SPARQL Processor). In addition, but not mutually exclusive to the prior usage scenario, can a single URI be used as a conduit to both FOAF file and OpenID authentication page? Example: http://myopenlink.net/dataspace/person/kidehen is a URI that both provides OpenID authentication and exposes a FOAF file. Updates welcome. I tried registering with most of these sites, to see if their FOAF was just members-only, and still found no joy. Note: A better way to make this page would be to make it in the data wiki and mash it up here as a table. This page was last modified on 20 November 2013, at 13:15.